Today we spent the day downtown. We started with a trolley ride from the start of main st. to the end. 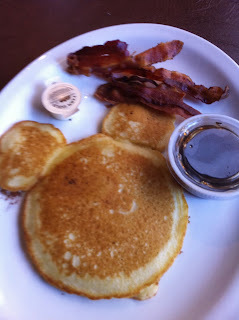 Who says you have to go all the way to Orlando for Mickey pancakes?! 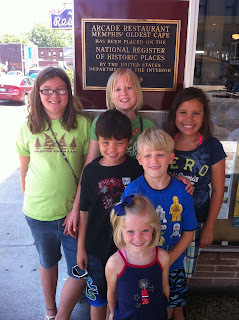 Then we headed over to Mud Island and played for a long while. Then end part where the river dumps into the gulf was still messy from the flood and the fountain wasn't running so we just went back to the beginning and let the kids play there for a while. This is one of the best (and totally free!) things to do in Memphis in my opinion.